For many years, the grapevine has been the victim of a kind of potassium obesity. Because grape growers were long paid on the sole basis of yield and high potential alcohol, tonnes of potassium have been spread in French vineyards of all types, AOC and otherwise. After the potassium wave, a new, organic wave is sweeping across the vineyard, coupled with suspicion about nitrogen fertilization. Once again, the initial euphoria has given way to disaster, as growers observe nitrogen deficiencies in the vineyard and winemakers are confronted with stuck fermentations in the cellar. Those who yesterday were calling for an end to all nitrogen fertilization are now selling leaf fertilizers (based on urea) to fight stuck or sluggish fermentations. Tomorrow, they will undoubtedly be selling urease in order to combat excess nitrogen and to prevent the formation of carcinogenic nitrogen compounds (ethyl carbamate) or allergens (biogenic amines). What will the next wave be? However, when low-pH vineyard soils are not rectified in some way, the parents, children and grandchildren are all ruined. In France, farming is very much soil-based, while in the English-speaking world, farmers are more plant-focused and in the “New World”, grape growers are mostly product-oriented. In brief, we can say that the French pay a lot of attention to soil balance (though for pH, this is not really true) and to encouraging microflora and microfauna via the addition of organic amendments. “Feed the soil to feed the plant.” That is the motto in France, though it does tend to ignore the concept of bio-availability, which is dependent on other factors (water stress, excess water, pH of soil solution, etc.). In the English-speaking world, growers spend a lot of time and money on leaf and petiole analysis, undoubtedly attracted by the scientific aspect of these measurements and the possibility of finding simple solutions to complex problems. This practical handbook of grapevine fertilization gives an overview of all these approaches, which are not mutually exclusive. What grower would think of neglecting the soil or not satisfying the needs of the plant or ignoring the requirements for producing good wines? For the first time, the mineral analysis of wines is used here to clarify fertilization problems, and practical solutions are offered. This represents an advance in well-reasoned grape growing, and while recommendations will undoubtedly have to be adjusted in the future, they do form the basis for a dialogue between growers and winemakers. Along with these relations between wine quality and fertilization, thought has also been given to grapevine nutrition and its relationship with diseases. For a number of years now, dieticians have been informing the public about good nutrition and the effects that a poor diet can have on human health. The same is true with plants. Some general principles are well-known to growers. Too much nitrogen = disease. Too little potassium = no ripening. But when it comes to the impact of lesser known minerals (P, Ca, Mg, S, etc. ), knowledge is rudimentary to non-existent. Something must be done about this, because increasing globalization requires growers to keep improving in order to stay competitive on the world wine market. In addition, the general public is also demanding more environmentally friendly farming. 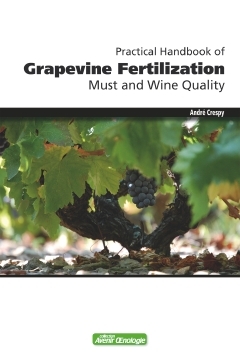 I hope that this practical handbook on grapevine fertilization (with its focus on wine quality) will help grape growers and winemakers. If it does, we will also benefit when tasting their wines! 1 - What Do Minerals Do? 2 - How to Assess Mineral Needs and Fertilizer Requirements? 3 - How to Assess the Effects of Fertilizer Addition?